Bike to Work Day is coming up on Wednesday, June 27. If you’re new to bike commuting or need a little motivation to get back in the game, this is the day to make it happen. More than 300 breakfast stations around the region will be serving up food and fun from 6:30 - 9 a.m. The Lone Tree breakfast station will be located at the intersection of the C-470 Trail and the Willow Creek Trail. Those benefits come in many forms. Bike commuters are less stressed and a little richer with each trip they take, compared to single-occupant car commuters. It’s also healthier and could actually save you time if you live within five miles of your workplace. Bike commuting also reduces traffic congestion and improves air quality. Ready to give it a try? Register your ride to be eligible to win prizes such as concert tickets, an e-bike or an all-expenses paid cycling trip to Iceland. While on the site, you can also map your route and see if there are any group rides planned in your area. 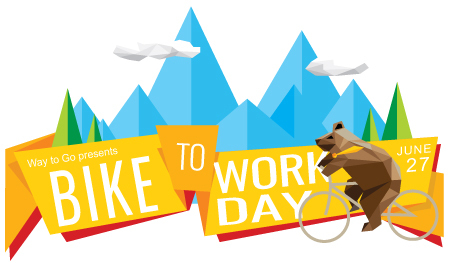 Get social on Bike to Work Day! Share photos of your favorite breakfast, the coolest swag or that awesome helmet hair. About the Organizer: Way to Go is a program of Denver Regional Council of Governments, a planning organization where local governments collaborate to establish guidelines, set policy and allocate funding in the areas of transportation and personal mobility, regional growth and development, and aging and disability resources. For more information visit waytogo.org.